With tons of tomatoes coming in from gardens, what better way to celebrate these warm summer evenings with a platter of goodies. 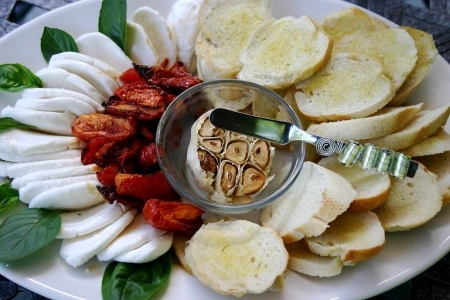 The sun-dried tomatoes can be made ahead but the garlic should be served warm if possible. The platter shown is an option. Add Italian sausage, Italian olives, or even baked eggplant slices to create your own version. Please note that the sun-dried tomatoes will take at least 2 hours. See recipe Sun Dried Tomatoes. Prepare Sun Dried Tomatoes the night before or in the morning and refrigerate. Warm sun-dried tomatoes just before serving or serve as is. Cut the top portion of the head of the garlic to expose all of the individual cloves of garlic. Drizzle with olive oil and sprinkle with kosher salt and pepper. Place on a small baking dish covered with foil and bake in a preheated oven at 375 degrees for 30 minutes or until garlic is soft and each clove can easily be removed from the head of the garlic. While garlic is baking, prepare croistini by slicing baguette on a diagonal, spray both sides with non-stick cooking spray and bake in a preheated oven at 375 degrees for 10 minutes or until slightly browned or slightly crunchy. Once all ingredients are prepared, arrange them on a large serving platter as shown in the picture above. Try Bogle Vineyards Sauvignon Blanc (California), Chateau St. Michelle Sauvignon Blanc Columbia Valley), Flensburger Brauerei Gold Premium Lager (Germany), Saint Arnold’s Lawn Mower (Texas) or Samuel Adams® Summer Ale (Boston, MA).